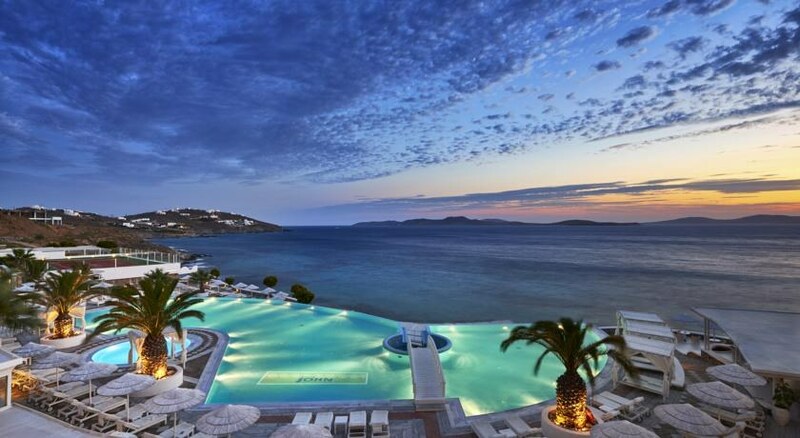 Saint John Mykonos Hotel Villas & Spa is a family friendly all - inclusive resort on Mykonos Island, Cyclades, set over 20,000 square metres of land and steps away from the lovely beach in Agios Ioannis. Boasting of a private beach, along with magnificent ocean views this 5-star hotel is a luxurious retreat in tranquility and bliss featuring an infinity pool, fine restaurants and superb spa, this is the ultimate venue to relax with gracious hospitality and impeccable service. As many as 136 ultra-luxurious and romantic rooms come with cable and satellite TV, free Wi-Fi, CD/DVD player and tea-and-coffee maker. The hotel’s strategic location offers tranquility from the touristy crowds with easy accessibility to local sights and attractions and vibrant Mykonian nightlife. 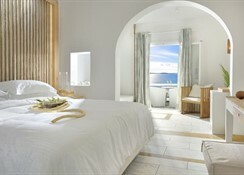 The resort is on Mykonos Island, Cyclades, set over 20,000 s.m land and steps away from the lovely beach in Agios Ioannis. The Mykonos Port is 6 km away. Sights and sounds of sizzling Mykonos Town (Chora) is 4 km away. The hotel is just Mykonos Airport is 4 km away, and the new Mykonos. Free private parking is available. Guests at the Saint John Mykonos Hotel Villas & Spa can choose from 136 well-appointed, ultra-luxurious guest rooms or 9 private suites or the 3 magnificent villas with private pools each offering sea or garden views. The rooms are equipped with cable and satellite TV, free Wi-Fi, CD/DVD player and tea-and-coffee maker. The hotel has a clutch of gourmet restaurants and lively bars to cater to the palate of guests. These provide a varied dining experience from casual to romantic. Kalimera located in the backdrop of the pretty Infinity pool, serves a sumptuous breakfast besides a la carte meals, tasty snacks and liquid refreshments, including tea and coffee. Symposium is a casual restaurant serving Greek and International dishes and Ilios another a la carte place. Guests can relax with a cocktail at the piano bar and 2 other bars. 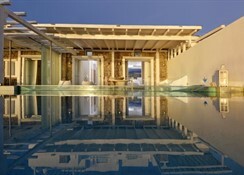 Saint John Mykonos Hotel Villas & Spa has three swimming pools including an Infinity pool and kids’ pool and terrace besides access to the private beach. There is a fully equipped gym for those who wish to stay active. There is the lovely Aphrodite Spa & Beauty Centre with 5 treatment rooms offering massages and therapies along with saunas, hammam and indoor heated pools. The hotel has facilities for Tennis. A ticketing service and tour desk prove helpful for guests.